The newly redesigned Youth Medallion is the perfect token to present to an outstanding youth in the congregation. There are instances where recipients of the Medallion still remember the honor as an adult. Each Men's Club is entitled to one youth medallion and certificate each year at no cost. That's right - one medallion and certificate FREE per affiliated Men's Club per year. Use the coupon code supplied with your Club's March 2016 Dues Statement Mailing, or enter a note when placing the order and the office will adjust the pricing based on the record of your previous orders. Coordinate with the Religious School for the selection of an outstanding student. One suggestion is that clubs order two youth medallions (one is free), and have the Religious School select an outstanding girl and an outstanding boy. 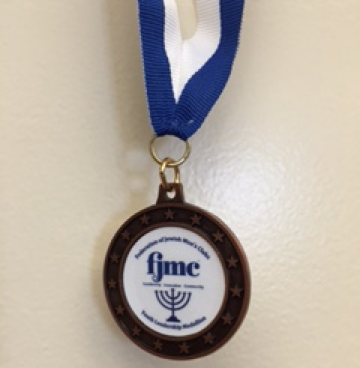 Present the medallions at the School's annual honors day along with Israel bonds or at your Men's Club annual Man of the Year event.